Due to its landlocked location, the climate of Qaraqalpaqstan is extreme continental. In the summer solar radiation is high and humidity is relatively low, the average July temperature reaching 28°C in the south and 26°C in the north. However maximum summer temperatures can reach 45°C, while in the open desert they can exceed 50°C. Winters are moderately cold with little snow, the average temperature in January falling to about -5°C in the south and about -8°C in the north. See Climate. The most pleasant times to visit are from late April to early June and from the beginning of September to early October. Early Autumn is a nice time to visit Qaraqalpaqstan. 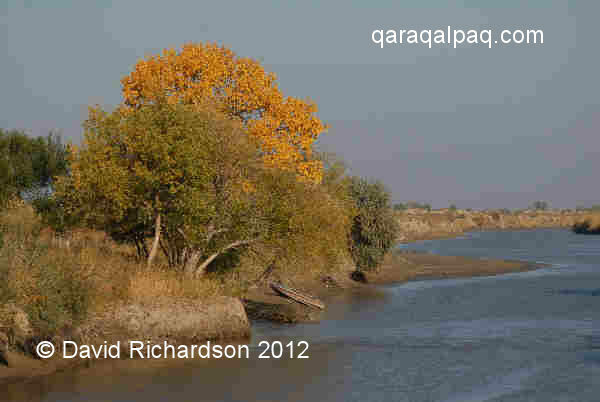 The banks of the Amu Darya near Altınko'l. In 2008 Ramadan coincides with the month of September. Again this will cause no difficulties for the traveller – virtually all restaurants still serve food throughout the day and alcohol remains freely available. Planning your itinerary depends on how long you intend to stay. You can spend a few hours at the museums without even staying at all – No'kis is just a two and a half hour drive from Khiva. With a two-night stay you can explore the No'kis museums and bazaar in one leisurely day and spend a tiring second day driving to Moynaq and back – a minimum three hour drive in each direction. Ideally you need to combine your visit with a day or two in Khiva, for us the nicest of all the tourist destinations in the viloyats of Uzbekistan. After leaving Khiva you can cross the Amu Darya by pontoon bridge to visit some of the archaeological sites beyond Biruniy. We thoroughly recommend an overnight stay at the perfectly located Ayaz qala yurt camp. Then make your way to No'kis via the Zoroastrian "tower of silence" of Shılpıq. With a four night stay in No'kis you can explore the sights of the city, spend a day at Moynaq, visit the nearby necropolises of Mizdarkhan or Qırantaw, and finally explore Shımbay and Taxta Ko'pir – ideally early on a Sunday morning so that you can visit both Shımbay bazaar and the Taxta Ko'pir livestock markets. It is very easy to visit Uzbekistan and Qaraqalpaqstan as independent travellers without the help of an agent. The one hitch is that if you come from a country where you need a visa support letter (see next section), such as the USA, Canada, UK, Holland, Spain, or Italy you will need the help of a Tashkent-based travel company. Most are happy to provide such a service for a fee – see Visas below. In the past there were no travel agents in Qaraqalpaqstan. One of the first tour operators to establish himself was Tazabay Uteuliev, who set up Bes Qala Nukus in 2006. 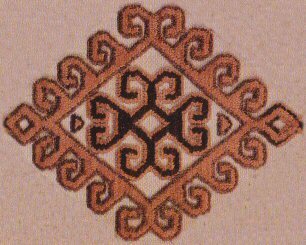 Bes Qala Nukus, 29-16 U. Yusopov ko'shesi, Nukus 742005, Qaraqalpaqstan. Tazabay was formerly an English translator and trainer for several NGOs in No'kis, including Counterpart International and the Qaraqalpaq branch of the Uzbek Association on Reproductive Health (UARH). He specializes in travel within Qaraqalpaqstan, especially adventure trips to the ancient qalas and to the Aral Sea. We have never used his services but have found him to be very prompt in responding to our requests for information. This is unusual in Qaraqalpaqstan. Please note that he is at present unlicensed. The Jipek Joli Hotel in No'kis also has a tour agency called Ayimtour offering a wide variety of services, from airport pick-up to trips to the qalas and the Aral Sea. Some of the Tashkent agents serving Qaraqalpaqstan. 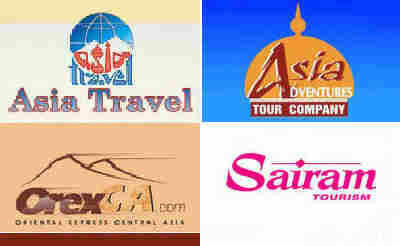 Asia Travel, 97 Chilanzarskaya Street, Tashkent 700115. They specialise in adventure travel, trekking, mountaineering and skiing. Asia Adventures, 46/17, Usman Nasyr Street, Tashkent 100100. Sairam Tourism, 13A Movarounnahr Street, Tashkent 700060. Oriental Express CA or OrexCA, Apt. 50/7 Center-5 block, Tashkent 100017. Advantour Uzbekistan, 116 Mirobod koshasi, Tashkent 100015. Oxus Voyage, I. P. Makhmud ulitsa, 141400 Khiva, Khorezm, Uzbekistan. For those planning to travel to Qaraqalpaqstan from Turkmenistan, requiring a reliable agent in that country, we recommend Ayan Tour in Ashgabat. 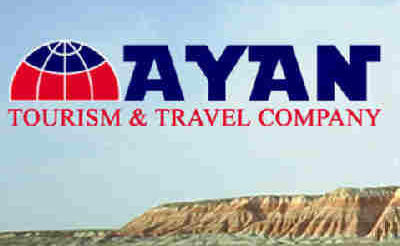 Ayan Travel, 108-2/4 Magtumkuli Avenue, Asgabat, Turkmenistan. Tourists visiting Qaraqalpaqstan as part of a group tour will be given appropriate advice by their local agent. Independent tourists need to fully understand all the rules, since entry regulations are rigorously enforced. All visitors must have a current passport valid for at least six months after the final date of departure. Visas are not required for citizens of the Russian Federation, Azerbaijan, Armenia, Belarus, Georgia, Kazakhstan, Moldova, or the Ukraine. Every other traveller must receive a visa for entry to Uzbekistan before arrival. Visas are issued by Uzbek embassies and consulates abroad and are not available upon arrival at airports in Uzbekistan. Applicants must declare any previous visits to Uzbekistan along with a list of the places they intend to visit. 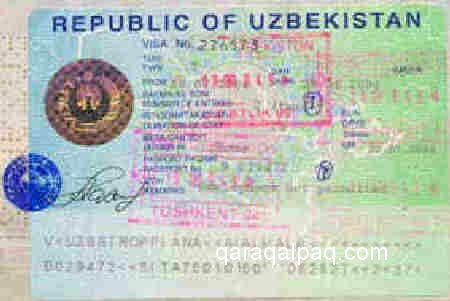 Uzbek visas are expensive, especially if a letter of invitation is required. In the past Uzbekistan operated a 72-hour transit rule that allowed travellers with visas from other members of the Commonwealth of Independent States to transit Uzbekistan without an Uzbek visa. This has now been suspended. Transit passengers without a visa cannot leave the transit lounge. Citizens of Austria, Belgium, France, Germany, Italy, Japan, Latvia, Malaysia, Spain, and Switzerland can apply for a visa directly from their local Uzbek embassy or consulate. Visitors from other countries, such as the USA and UK, must arrange a "visa support letter", sometimes called a "letter of invitation", which must be organized through a local Uzbek travel agent authorized by "Uzbektourism", the National Tourism Agency. The agent will contact the Immigration Department of the Ministry of Internal Affairs in Tashkent, who will first vet the application before faxing a copy of the support letter to your local embassy. For this simple task you can expect to be charged from $20 to $50 per person, depending on the agent. All of the above travel agents provide this service. Click here for some additional information. Check with your local embassy that they have received the copy of your letter of invitation before submitting your visa application. Tourist visas for Uzbekistan are issued for periods of 2 weeks, 30 days, or 3 months and can be for either a single entry or multiple entries. Visitors planning a side trip into Turkmenistan and back will obviously need a multiple entry visa. Uzbek visas and associated fees are remarkably expensive. In the past visa fees have normally been charged in US dollars, so people applying outside of the USA have had to calculate the appropriate amount in their own local currency. However in London the Uzbek consulate has recently been asking visa applicants to pay in Sterling when they telephone for advice. The fee for a 30 day visa has been £47. The Republic of Uzbekistan has missions in the following countries: Afghanistan, Austria, Azerbaijan, Belgium (Luxemburg), Canada, China, Egypt, France, Germany, India, Indonesia, Iran, Israel, Italy, Japan, Kazakhstan, Korea, Kyrgyzstan, Latvia, Malaysia, Pakistan, Poland, Russian Federation, Saudi Arabia, Tajikistan, Turkey, Turkmenistan, Ukraine, USA, and Vietnam. It has consular departments in the following cities: Athens (Greece), Bangkok (Thailand), Dubai (UAE), Frankfurt (Germany), Istanbul (Turkey), Jeddah (Saudi Arabia), Mazar i-Sharif (Afghanistan), and New York (USA). 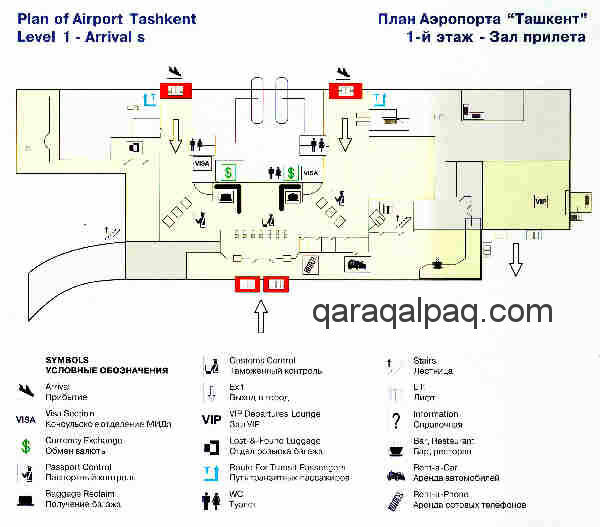 Most tourists arrive in Qaraqalpaqstan having entered Uzbekistan via Tashkent (airport code TAS). As the enthusiasm for visiting Central Asia has waned in recent years, so international carriers such as Lufthansa, British Airways, and Air France have pulled their routes to Uzbekistan, leaving Uzbekistan Airways (airline code HY) with a virtual monopoly. The current lack of competition for Tashkent routes means that Uzbekistan Airways ticket prices tend to be high. Uzbekistan Airways is expensive and has below average customer service. 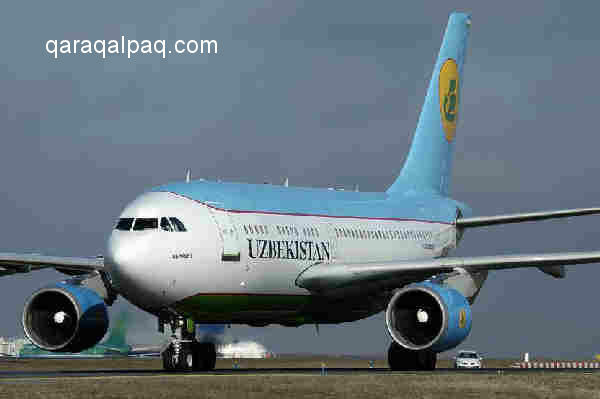 Formed in 1992 following Uzbekistan's declaration of independance, Uzbekistan Airways (Uzbekiston Havo Yullari) inherited the former assets of the Uzbek operations of Aeroflot. 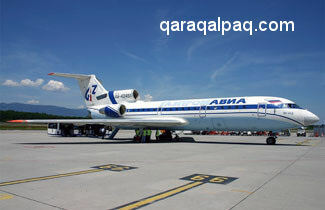 It is regarded as one of the better managed post-Soviet airlines with a strong committment to modernize. It has a reasonable safety record and its technical staff are trained by Lufthansa. The US Federal Aviation Authority does not assess individual airlines but does consider an individual country's ability to support its aviation services. The FAA foreign assessment programme has given Uzbekistan a Category 1 rating (the same as Canada, Japan, Germany, France, Italy, and the UK) for complying with international standards and recommended practices for aircraft operation and maintenance. However Uzbekistan Airways does not have a 100% safety record - it has had seven accidents in the last twenty years, all involving aircraft of Soviet manufacture. With regard to customer service, the UK-based airline quality assessment company Skytrax only gives Uzbekistan Airways a two star rating. The airline scores poorly on economy check-in, flight amenities and entertainment, and cabin staff response to pasenger requests. As frequent Uzbekistan Airways customers ourselves, we fully endorse their assessment. Uzbekistan Airways fly to Tashkent from New York (via Riga), London, Frankfurt, Paris, Milan, Rome, Moscow, Istanbul, Cairo, Delhi, Seoul, Tokyo, Bangkok, and Kuala Lumpur. and medium haul Boeing 757-200s. Schedules change frequently and travellers should get up to the minute information. Some services only run during the high season. Unfortunately the Uzbekistan Airways website: http://www.uzairways.com is slow and frequently out of operation – welcome to Uzbekistan! Uzbekistan Airways is a far from easy airline to deal with directly and we recommend that you book your flights through your local travel agent if at all possible. In No'kis the Uzbekistan Airways office is at 43 Pushkin ko'shesi, telephone 222 78 63. In the UK the Uzbekistan Airways flights to Tashkent are frequently heavily booked by Asian travellers heading on by a connecting flight to the Punjab city of Amritsar. Market pricing dictates that they pay considerably less than customers who are only flying to Tashkent. Among the limited alternatives now available are Aeroflot, who have four flights a week from Sheremetyevo, 29km north-west of Moscow; Turkish Airlines, who fly from Istanbul; and Turkmenistan Airways (even worse than Uzbekistan Airways), from Ashgabat. 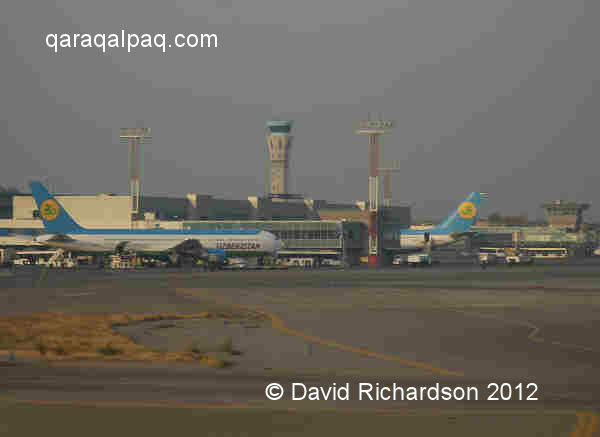 The terminal and control tower at Tashkent Airport, 2007. Tashkent Airport has been significantly upgraded in recent years. Once you get through the crowd of relatives waving farewell to their loved ones at the entrance the check-in area is large, airy, and airconditioned and the walk to the departure gates is straightforward. However the two waiting areas can be very busy. The arrivals area is much more cramped however, and there are only two small luggage carousels. Consequently arrivals can be chaotic, especially since many overnight flights from Europe are scheduled to arrive at around the same time. The processing of arriving travellers is slow, bureaucratic, and disorganized, so queues can be long. Furthermore, many locals arrive with bulky purchases, all of which must be x-rayed, making the process of arrival even more frustrating. 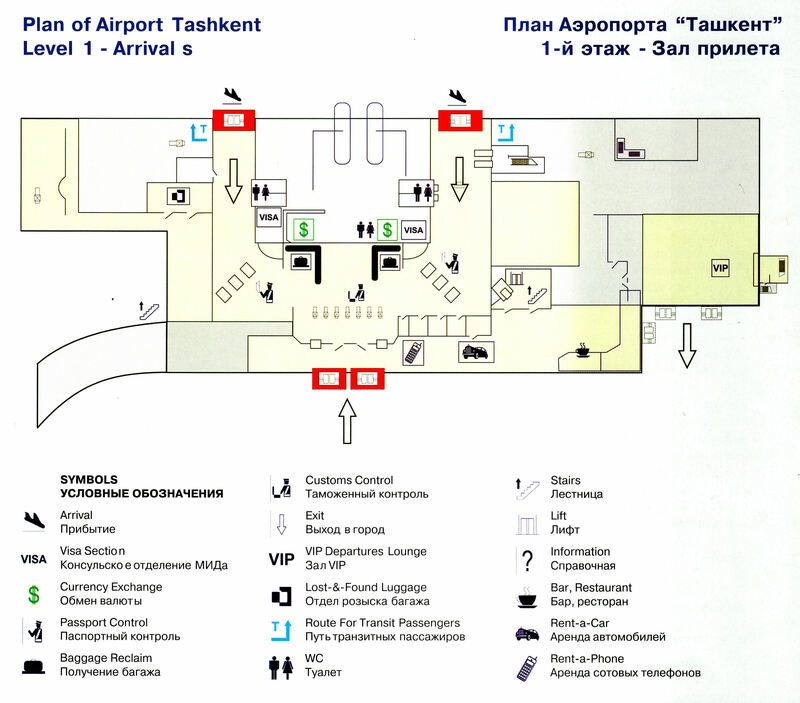 Plan of Tashkent Airport arrivals level. For a downloadable version click here. To download the departures level click here. HY625 departs No'kis 1925, arrives Moscow Domodedovo 2100. HY626 departs Moscow Domodedovo 2230, arrives No'kis 0350 the next morning. 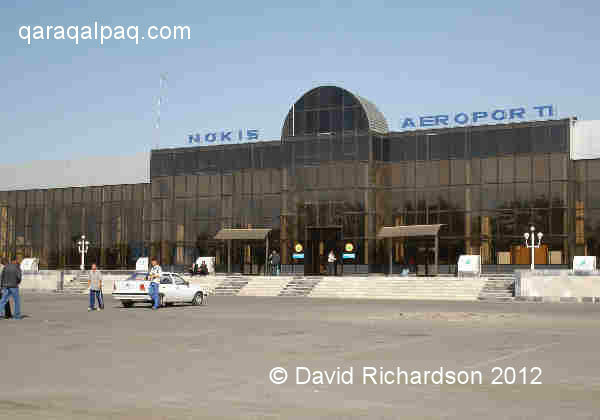 Foreign visitors can enter Uzbekistan through No'kis airport. Flight time for the 2,100km trip is around 3½ hours. In March 2006 the aviation arm of Gazprom, Gazpromavia, started up a new weekly passenger service from Vnukovo International Airport, 25km south-west of central Moscow, to No'kis using Yakovlev Yak-42 tri-jets. The flight was scheduled on a Thursday under the winter 2007/8 schedule, with OP601 departing Moscow at 0930 and the return flight OP602 departing No'kis 1650. Flight time is 3 hours 50 minutes. This flight is not only used by gas workers employed in the Ustyurt and Aral Qum gas fields but can be booked by ordinary passengers as well. The Gazprom Yak-42 service to No'kis. In May 2006 the Russian airline S7, Sibir Airlines, launched flights between Moscow Domodedovo and Urgench in the neighbouring viloyat of Khorezm. Flight S7-965, and the return flight S7-966, currently operate each Tuesday using Tupolev T154 tri-jets. The flight leaves Moscow at 1055, arriving in Urgench at 1620; returning from Urgench at 1740, arriving in Moscow at 1925. The one way fare starts from $190. Flights are less frequent during the winter. On departure each individual must complete a second pair of forms, declaring the list of the valuable temporary imports you are departing with and the quantity of individual currencies remaining. The same system applies each time when you make multiple entries. Problems arise if the list of items you are departing with includes items that were not on the list you submitted on entering the country. Uzbek customs authorities are very sensitive to the export of antiques, coins, jewellery, Oriental carpets, old textiles, and other ethnic artefacts without a license issued by the Uzbek Ministry of Culture. The definition of antique means anything that looks old. Export licences are not easy to obtain and even if granted require much time and patience to obtain. If you are forbidden to export an item you have purchased, you can either leave it with your Uzbek guide or see it confiscated. Importation of currency exceeding $10,000 (US) is subject to a one percent duty. In theory foreigners can face fines upon departure if they are unable to produce certificates verifying the legal conversion of their foreign currency. They may also be asked for receipts to account for their local expenditure. In practice foreign tourists are generally left alone unless something shows up during the x-ray of their baggage. Be warned, Tashkent airport uses sensitive modern x-ray equipment, which can even identify the patterns on carpets hidden inside your baggage. There is at least one daily flight between Tashkent and No'kis (airport code NCU), normally HY1001/1002, which departs at around 0700. This is usually an Antonov twin-propeller AN-24, which is rather noisy and slow, taking 2¾ hours for the journey. There are normally two flights a day to nearby Urgench, the closest airport to Khiva. However schedules can change without warning and occasionally the two flights are combined into one. At other busy times they sometimes put on a second, later return flight to No'kis - HY1007/1008. The flight path goes south of Aydarku'l Lake and the approach to No'kis offers good views of the Amu Darya and the Qizil Qum, which comes right up to the edge of the city. The cabin crew often announce that photography from the plane is forbidden, for reasons that are beyond our comprehension. No'kis Airport is small and modern and a pleasure to travel into and out of. The airport is on the edge of the city only 2km from the centre. Unlike other airports in Uzbekistan, security seems more relaxed and it is possible for vehicles to stop directly outside the terminal. Taxis are normally available outside the terminal building. If not, the main road - Doznazarov - is just a 50 metre walk away and there you can hail a passing bus or jo'nelisli into the centre. A cheaper and more interesting way to reach Qaraqalpaqstan is by rail. The main advantage of entering Qaraqalpaqstan by train, especially from Kazakhstan, is that you traverse a completely different part of the country that people rarely get to see. Travelling from Tashkent by train rather than road means that you avoid over a dozen road checkpoints. In the past travel by rail was not recommended in Uzbekistan, other than for rail enthusiasts. The older tracks are uneven so many trains are slow, and seats can sometimes be hard and uncomfortable. However things are changing fast. In 2007 a new air-conditioned train service came into operation between Bukhara and Tashkent, replacing the earlier overnight service. The train from Bukhara leaves Kagan station daily at 0805, while the return train from Tashkent leaves daily at 0815. The journey takes just 6½ hours. Local people were so impressed that they were no longer using the bus but were taking a packed lunch and enjoying the train. Unfortunately a comparable service does not yet operate between Tashkent and No'kis, but it is likely that the quality and speed of trains will be upgraded in time. The train from Tashkent to Saratov. Image courtesy of Helmut Uttenthaler. Visitors travelling to Qaraqalpaqstan from Russia can book their tickets up to 45 days ahead at any railway station, but must present their passport when making a booking. Purchasing tickets from ticketing agencies is considerably more expensive. Firmenny high-quality trains with the most modern carriages, usually air-conditioned and with good on-board service. Skory express trains, usually with three classes of sleeper wagon and generally with a restaurant car. Passazhirsky ordinary trains, often relatively slow and with older carriages. They typically have 3-digit train numbers and are cheaper than firmenny or skory. First Class, known as Spalny Vagon or SV, myagky or lyux, with 2-berth compartments (9 per coach) containing lower-level berths on each side. 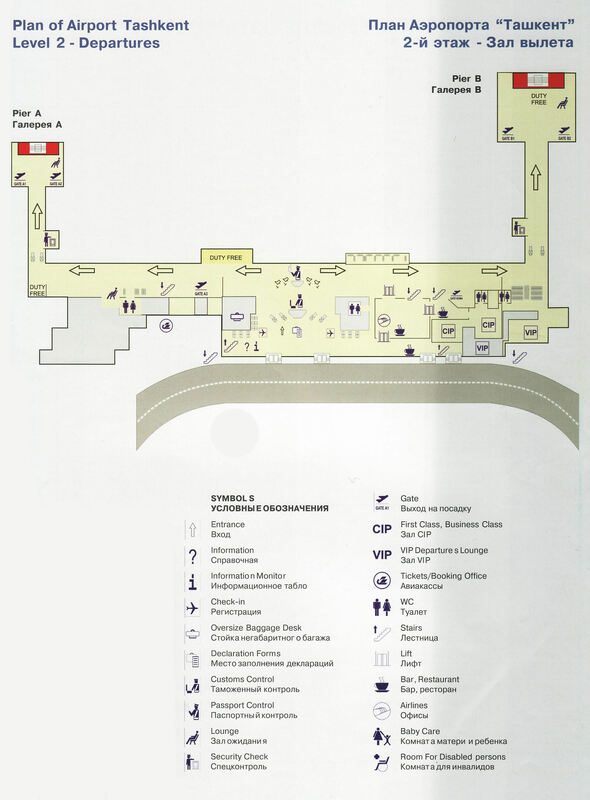 Washrooms and toilets are at the end of the corridor. Second Class, known as Kupé, with 4-berth compartments (also 9 per coach) and again washrooms at the end of the corridor. Third Class for the budget conscious, known as Platskartny, with open-plan dormitory-style coaches, each containing 54 berths. 320 Moscow Kazanskaya to Dushanbe, Tajikistan, operates three or four times a week (Saturday, Monday and Wednesday and sometimes Sunday as well). 321 Almaty to No'kis, via Tashkent, operates once a week (leaving Almaty on a Sunday and No'kis on a Tuesday). 330 Moscow Kazanskaya to Kulyab, southern Tajikistan. Xudjand (Khodjand), Tajikistan, operates twice a week (Tuesday and Friday). 332 Saratov (on the Volga) to Tashkent, once or twice a week, days vary by season. 334 Saratov to Tashkent, once a week, days vary by season. 336 Saratov to Xudjand, Tajikistan, twice a week, days vary by season. 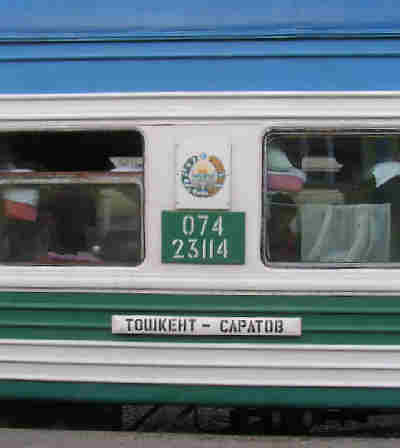 However at the time of writing (March 2008) the Moscow services to Tajikistan cannot be used for travelling to Qaraqalpaqstan or Uzbekistan, despite the fact that their schedules indicate times of arrival at Beyneu in Kazakhstan and at Qaraqalpaqia, Jaslıq, Qon'ırat, and To'rtku'l stations in Qaraqalpaqstan. The train is scheduled to take about 72 hours to reach Kungrad (Qon'ırat in Qaraqalpaq) from Moscow. To get to Qaraqalpaqstan from Russia it is first necessary to get to Saratov and then take the 332 service to Tashkent, which stops in No'kis. After crossing the border of Qaraqalpaqstan the train first stops at Qaraqalpaqia, where customs checks are made. Customs forms are handed out on the train. Further stops occur at Jaslıq, Qon'ırat, and Taqıyatas stations. After No'kis the train stops at To'rtku'l and Miskin before heading off across the Qizil Qum. The train takes about 42 hours to reach No'kis from Saratov. The Almaty train terminates in No'kis after stopping at Miskin, To'rtku'l, and Kaibek. It takes 46 hours to reach No'kis from Almaty and just 23 hours from Tashkent. 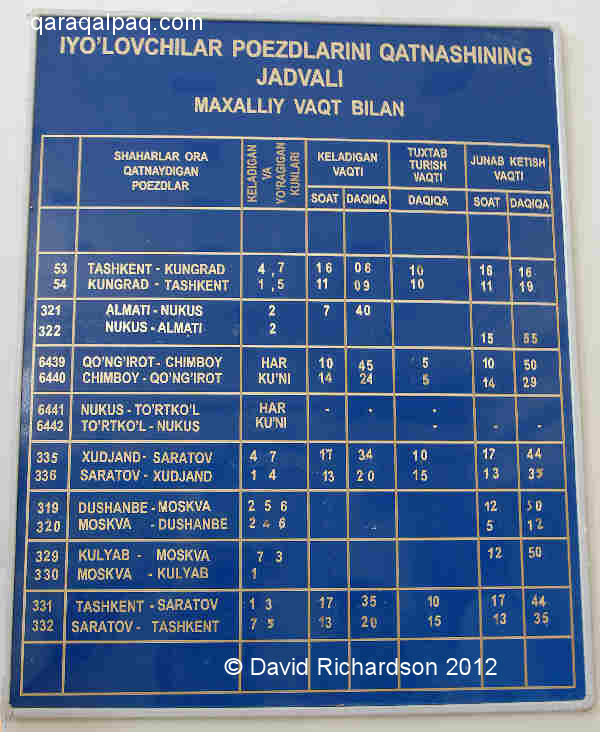 Train schedule at No'kis Station (in Uzbek). There is also a train service between Kazakhstan and Qaraqalpaqstan. The 917/918 runs between Qon'ırat and Beyneu, taking 12 hours and stopping at all the small stations along the way. Passengers should pay attention to their luggage and not leave it unattended. We have friends who have had their bags stolen from under their noses by small gangs who create a commotion to cause confusion. Ensure that all your documentation is in order and refuse any open or veiled requests for additional payments. It is advisable to take your own toilet paper. Locals tend to take their own food. Bed linen is normally available for a very small extra charge from the carriage attendants, who also serve tea and snacks. In addition hot water is provided free of charge from a samovar in each carriage. There is usually a dining car offering local dishes like plov. We have received information that customs checks can get quite physical, especially if you are a young man travelling alone. Officials are more respectful of people in authority, the elderly, and the infirm. 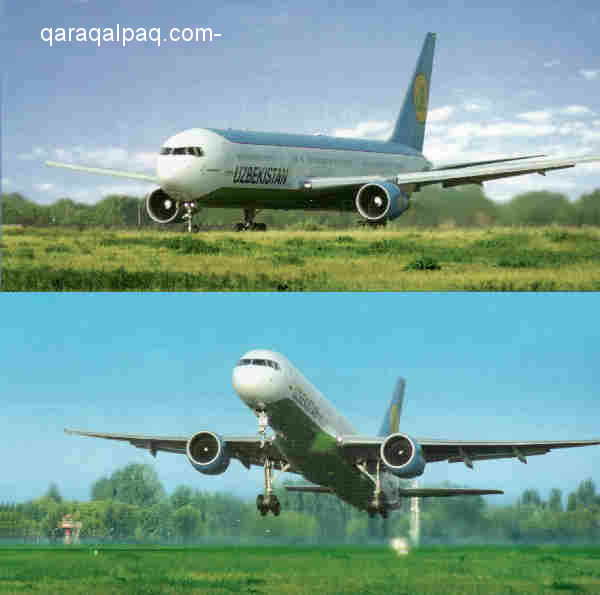 To purchase a ticket in Uzbekistan/Qaraqalpaqstan passengers also have to present their passport. Tickets are purchased in so'm. Children between the ages of 5 and 10 travel at half price. Those less than 5 travel free. In the past the rail line from Tashkent passed through two parts of Turkmenistan before reaching No'kis. To avoid customs and other problems the local train operator, Uzbekiston Temir Yullari (UTY), constructed a new single-track railway line across the Qizil Qum from No'kis to Navoi via Uchkuduk and Zeravshan. The 500 km long line, which opened in 2001, was built in three years by political prisoners from Uchkuduk prison. At Navoi it joins the old line to Tashkent via Gulistan. Then a new spur linking No'kis to To'rtku'l was opened in 2002. 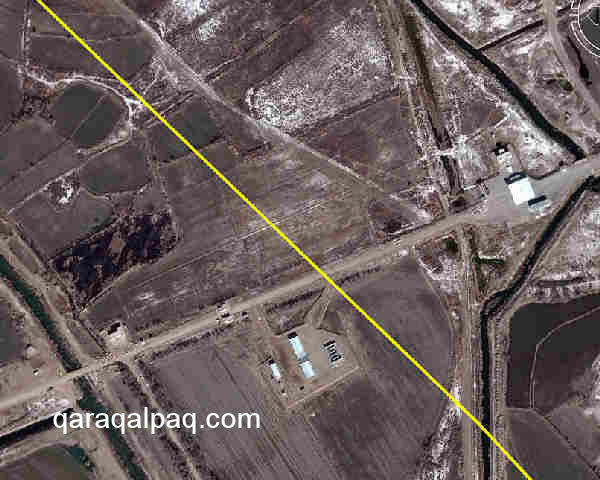 Following the construction of the new "Amudarya" rail and road bridge in 2004, the new line on the right bank was linked to Hazarasp and Urgench stations in left bank Khorezm. The modern Railway Station in No'kis. No'kis railway station, or vokzal, is clean, modern, and spacious and has an internal waiting area with seating. It is situated on the outskirts of the city, at the very southern end of Dosnazarov ko'shesi, about 2km south-west from the centre. It is about 5.8km from the station to the airport, which is also situated just off Dosnazarov. There is a bus and taxi station outside the station exit on the right, along with several small cafés. One café is next to the station and the small Kafe Ostrov is just over the road. There are also a few small shops. Uzbekistan Railways has an official website: http://www.uzrailpass.uz/ with pages in Uzbek, Russian, and English containing useful information on timetables and fares. Unfortunately the Russian railways website at http://www.rzd.ru is only in the Russian language. A more useful site for English speakers is http://www.russia-ukraine-travel.com/trains-in-russia.html, although it may not be so up-to-date. 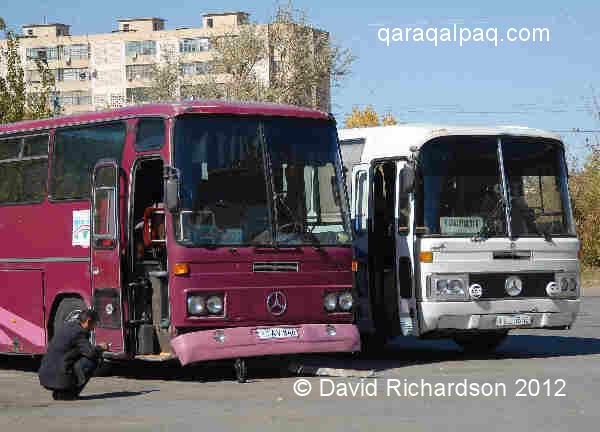 The cheapest way to get to Qaraqalpaqstan overland is by long-distance bus. There is even a dirt-cheap bus that comes from Moscow, crossing the Ustyurt plateau, but this is terribly overcrowded and is not recommended except for the destitute. Air-conditioned buses run regularly from No'kis to Tashkent, some going onwards to Almaty. It takes coaches 10 to 11 hours to get to Bukhara, 20 hours to get to Tashkent, and 36 hours to reach Almaty. 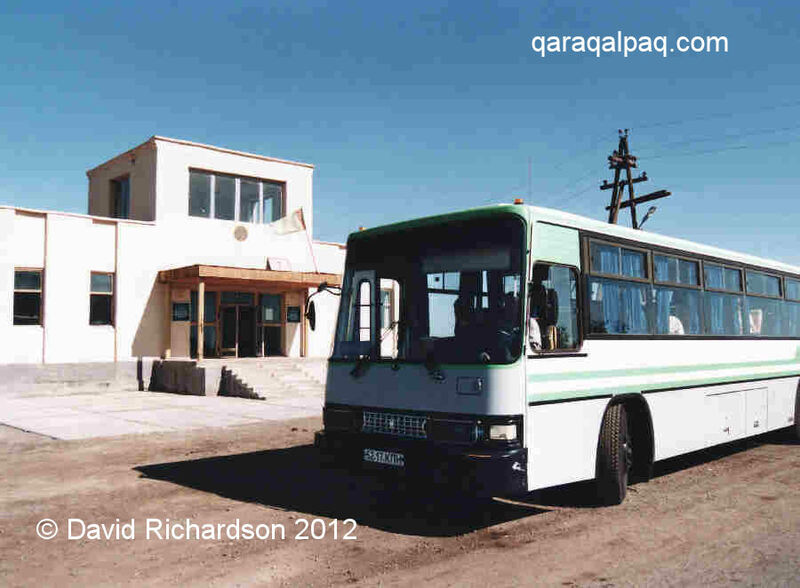 There is also a bus service crossing the Qara Qum from Ashgabat to Dashoguz in northern Turkmenistan. Note that drivers leaving No'kis far prefer passengers who are travelling all the way to Tashkent. If you only want to go to Bukhara, you might have problems if business is brisk. Tashkent buses parked outside the No'kis Hotel in No'kis. The buses themselves are normally old Mercedes that have been imported from private operators in Germany or Turkey. Though ten or more years old, they are generally quite serviceable. However there have been a number of fatal accidents involving buses along the A380 highway from No'kis to Bukhara and along the narrow cross-desert route from Ashgabat to Dashoguz. The Turkmen police have consequently outlawed overnight bus travel but some buses still run. There are several bus stations in No'kis, with buses going to different destinations from each location. Long-distance buses from Tashkent stop outside the No'kis Hotel in the city centre. Unless you are on a really tight budget it is quite affordable to hire a car and driver to make the journey from Bukhara, Khiva, or Urgench to No'kis. This gives you the freedom to stop for photos whenever you like and set your own itinerary. This can be arranged through your hotel. In Khiva you can book a car through the Tourist Information centre opposite the Kalta Minor. Drivers also lurk around outside the main entrance to the Ichan qala touting for business. The most comfortable cars to hire are the locally made Daewoo Nexia or Daewoo Matiz. Occasionally you might find an old Mercedes. Avoid Ladas or other older vehicles for long journeys. Larger minibuses are available but are not very common. It is best to book ahead. 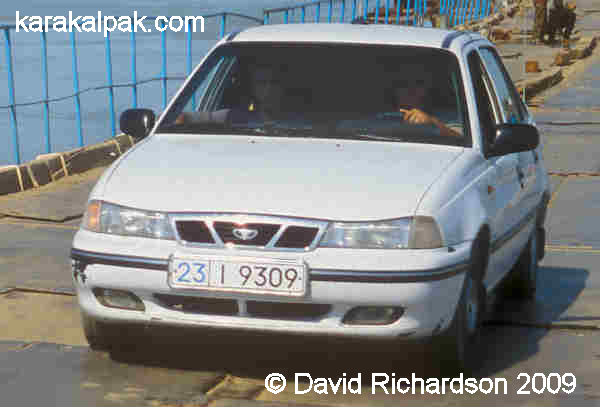 An UzDaewoo Nexia four-door saloon, made in Uzbekistan. In the past we have been provided with a very professional service from a local company based in Urgench run by Sergey Akhmedov. In 2007 a car from Urgench to Bukhara was $80 and a minibus was $150. We paid $150 for a car and driver from No'kis to Bukhara and $100 for a two-leg journey from Biruniy to Khiva and then Khiva to No'kis a few days later. Sergey Akhmedov's company can be contacted through the following numbers: home 362-222-65-388 (362 is the area code for Urgench); mobile (+998 62) 251 55 38; (+998 62) 515 53 88; and (+998 62) 221 53 88. In recent years the quality of the road between Tashkent and No'kis has improved markedly. It was once necessary to break the journey for overnight stops in Samarkand and Bukhara. However today it is possible to drive from Tashkent to Bukhara in about 7 hours depending on rest stops. Bukhara to No'kis currently takes about 6 to 6½ hours. The main A380 highway from Bukhara to No'kis is straight with few bends. The condition of the road is good given the relatively low volume of traffic. The highway is wide (a minimum of 10 metres) and has a metalled surface. The only problems arise in the vicinity of roadworks when traffic is often forced to negotiate long sections of rough unsurfaced road. The amount of traffic is minimal, apart from in the outskirts of major centres. A recent traffic survey measured only 1,900 vehicles a day on the Khorezm section of the A380 and a minimal 364 vehicles a day on the corresponding Qaraqalpaqstan section. Police radar speedchecks are common in built-up areas. Once out of the cities the main highways are fairly deserted. A recent loan from the Asian Development Bank means that sections of this route will be further upgraded between 2008 and 2011. The main irritation of travelling by road is the frequency of road police checkpoints. Each viloyat has its own border checkpoint, so you are checked out of one province and checked into the next. Someone once counted that there are fourteen checkpoints between Tashkent and No'kis. All cars must stop but cars containing Western foreigners are generally waved through. If the police do request you to stop, they are mainly interested in your driver's documentation. Only occasionally have we been asked to show our passports or to open our luggage. Many visitors to Qaraqalpaqstan will want to visit the important nearby ruins of Gurganj (just outside of Konya Urgench), which are only 30km from Xojeli. Some will want to get to Dashoguz to get a local flight to Ashgabat. More adventurous travellers will have made the interesting journey across the Qara Qum from Ashgabat, staying overnight at the truck-stop close to the old Darvaza sulphur mine. 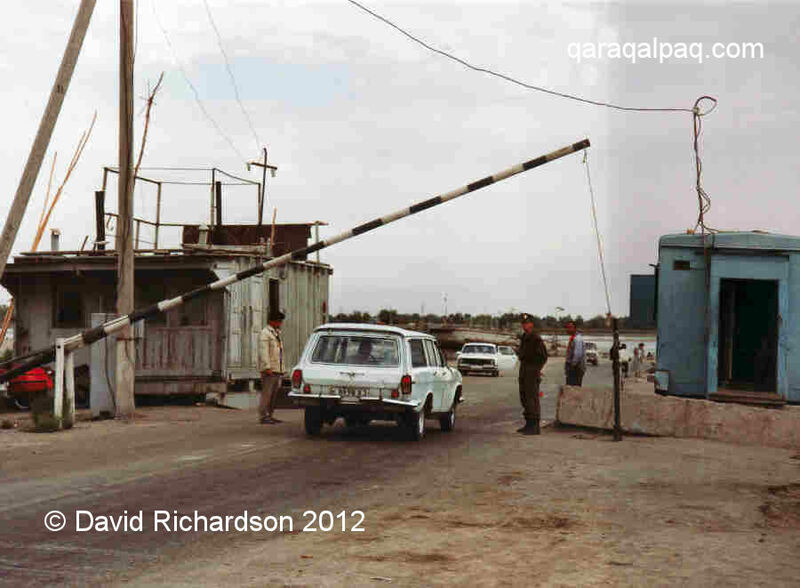 Crossing from Qaraqalpaqstan into Turkmenistan at the Turkmen checkpoint in 1996. At this time it was possible for buses to cross the border, although it required many hours of waiting. 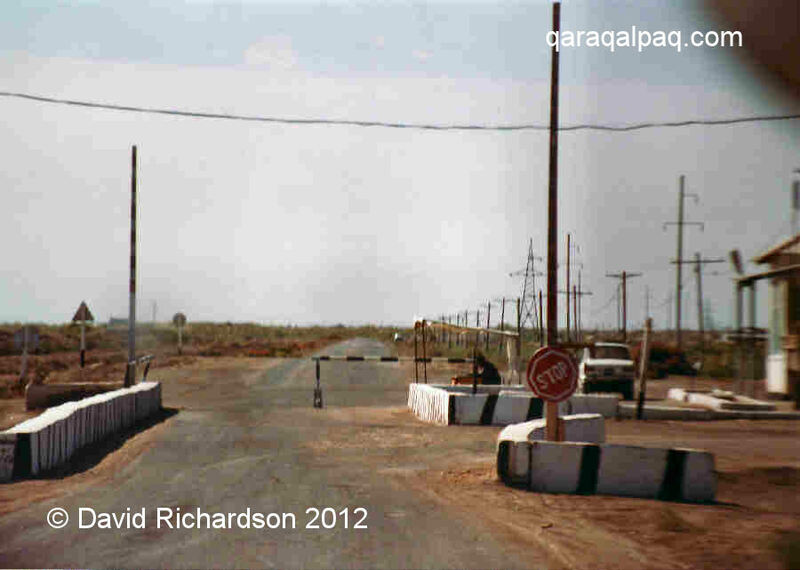 Some years ago it was possible to take a vehicle across the border into or out of Turkmenistan at the Xojeli/Mizdahkan-Konya Urgench border post. However more restrictive regulations regarding the importation and exportation of vehicles and fuel (mainly imposed by Turkmenistan) make this an impractical option today. The Turkmen checkpoint near Ma'ng'ıt is only open to locals. Foreign travellers must use the Xojeli-Konya Urgench crossing. Today it is advisable to arrange for a vehicle to rendezvous with you on the other side of the border. For example, if departing from Turkmenistan, you first say goodbye to your Turkmen driver and carry your luggage to the Turkmen border post to clear emigration and customs. This can take some time, even when there is little cross-border activity - on one occasion we spent four hours waiting to be cleared. However couples travelling alone normally get through within the hour. Normally all bags are hand-searched. You then walk half a kilometre through no-man's land to the Uzbek border to have your visa checked and to complete your duplicate customs declaration. In the past bags were not hand searched on entry. However the Uzbek authorities are continually upgrading their border controls. Once your documentaion is checked you are free to enter Qaraqalpaqstan and liaise with your local driver who will hopefully be waiting for you. The Xojeli-Konya Urgench border checkpoints - Turkmenistan on the left, Qaraqalpaqstan on the right. They are about 600 metres apart. Image courtesy of Google Earth. 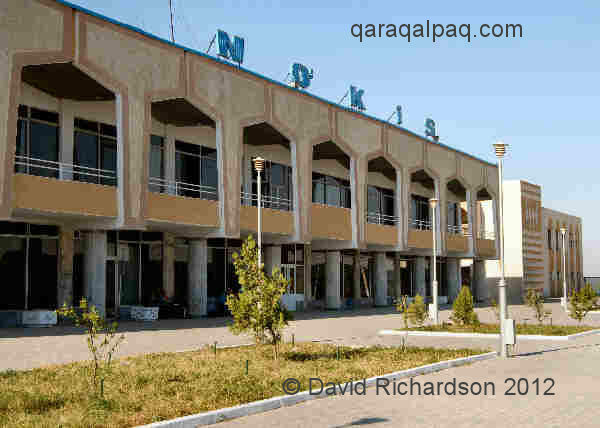 If you are staying at the Jipek Joli Hotel in No'kis they will arrange a car to collect you from the border for $25 - see Accommodation in Qaraqalpaqstan. There are no bus services operating on either side of the border crossing. The Uzbek checkpoint is 12km from Xojeli. It is also possible to enter Qaraqalpaqstan from western Kazakhstan. Starting from Astrakhan, Uralsk, or Aqtubinsk, you must first drive to Makat. From there a rough road runs across the Ustyurt plateau to Beyneu before crossing the Qaraqalpaqstan border at Oazis and continuing on to Kungrad (Qon'ırat in Qaraqalpaq). The road - if it can be called such - is unmetalled for most of the Qazaq section, consisting of wide corridor of parallel tracks. 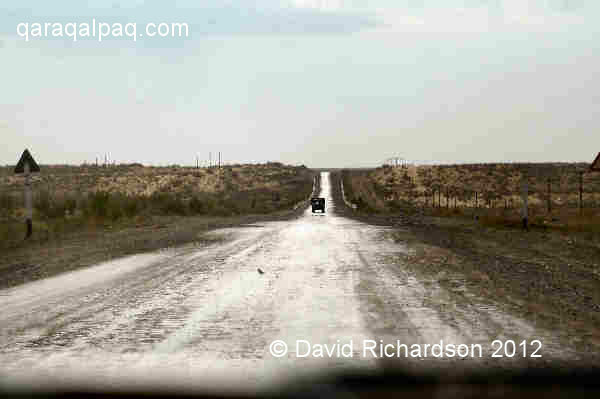 It can get quite muddy in places, especially between Beyneu and the Qaraqalpaqstan border. 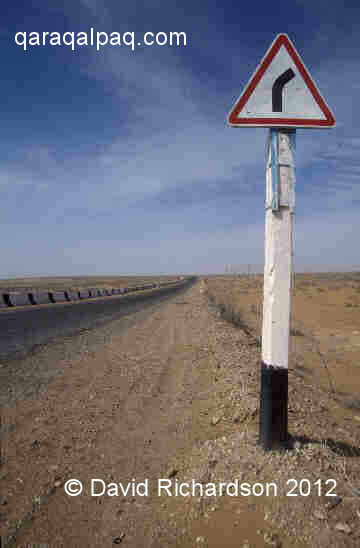 In Qaraqalpaqstan the road generally follows the railway line. It is unmetalled from the border to Jaslıq, but is metalled from Jaslıq to Qon'ırat. People who have used this road tell us that it is navigable without the need for a 4WD vehicle. In recent years this route – known as the RD5 corridor - has become increasingly popular as a link between Russia and Qaraqalpaqstan, used by large trucks and buses and for the importation of Russian-made cars. The United Nations has been promoting the idea of a Pan-Asian Highway across Central Asia and now the Uzbek government are planning to upgrade and extend the existing A380. Part of the justification is to improve communications to Qon'ırat, Qaraqalpaqstan's second major economic centre after No'kis. The aim is to create a long-distance route between Guzar in southern Uzbekistan and the border crossing at Oazis (close to Beyneu in Kazakhstan) via Bukhara and No'kis. However the short-term priority is to improve the quality of the A380 on some of its busiest sections, so it may take some time before the route across the Ustyurt gets upgraded. It is vital that travellers using this crossing point obtain official entry clearance, having their passports stamped before they leave Kazakhstan and after they enter Qaraqalpaqstan.